Starting from the roof top of Africa in Moshi this spectacular seven days of wildlife wonders commences. 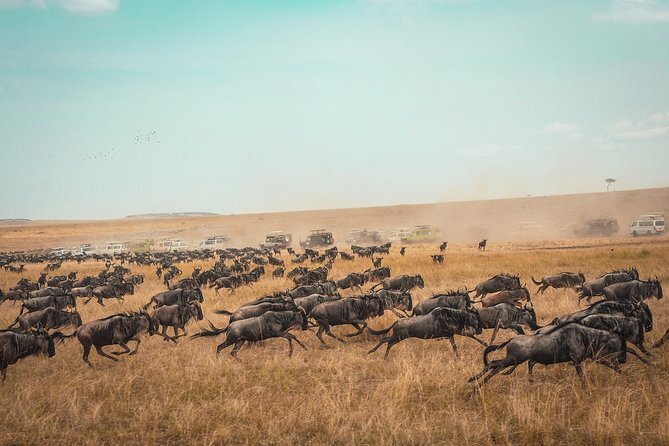 It takes you through the best National Parks in the world and you will amazed in the wildlife galore of Tarangire, Lake Manyara, the magnificent Serengeti and the world heritage Ngorongoro Crater. Lion and cheetah, elephants and buffalo, as well as fascinating bird life, all in incredible environments, provide the highlights. With your own private vehicle to enjoy your wonderful experiences, your accommodation on this amazing trip will be in a combination of hotel in Moshi and safari camps in the parks. • Full board accommodation whilst on safari • Private safari guide • Maasai experience tour • Extended Toyota Land Cruiser with pop up roof for game viewing • Airport Transfers • All entrance Park fees • All meals while on safari. • One night hotel accommodation in Moshi/Arusha. After breakfast the tour departs heading towards the Tarangire National Park for a game drive with picnic lunch at the park. Tarangire is well known for its huge elephant population and baobab trees. It forms the center of an annual migratory cycle that includes elephants, wildebeest and zebras. Dinner and overnight at lodge or safari camp. After breakfast the tour departs heading to Lake Manyara. The park offers breathtaking views and a large variety of habitats i.e. acacia woodlands, water forests, baobab strewn cliffs, algae-streaked hot springs, swamps and the lake itself. And thanks to this the small park is able to support a large number of animal species and incredible bird life. Manyara has the largest concentration of baboons anywhere in the world and the lions here are also renowned for their tree climbing. Dinner and overnight at lodge. After breakfast, departs for Serengeti National Park, via the beautiful high lying farmland of Karatu and the Ngorongoro Conservation Area. Leaving the highlands behind, we descend into the heart of wild Africa with its endless plains, rolling into the distance as far as the eye can see. Then head to Seronera area, one of the richest wildlife habitats in the park, Arrive in time for lunch and enjoy an afternoon game drive in the Serengeti national park. Dinner and overnight at lodge or safari camp. Full day Serengeti National Park game drive. Dinner and overnight at lodge or safari camp. Early morning game drive and after departs to Ngorongoro Conservation Area. We will stopover at Olduvai Gorge, boasting with a history dating back to the dawn of time. It was here; that the anthropologists discovered the skulls of ‘Nutcracker Man’ and ‘Handy Man’, both very significant links in the chain of human evolution late afternoon transfer to lodge where you will have dinner and overnight. After an early breakfast, you will descend over 600 meters into the crater to view wildlife. Supported by a year round water supply and fodder, the Ngorongoro Conservation Area supports a vast variety of animals, which include herds of wildebeest, zebra, buffalo, eland, warthog, hippo,giant African elephants and its dense population of predators.Late afternoon transfer to Arusha for dinner and overnight or airport drop off.